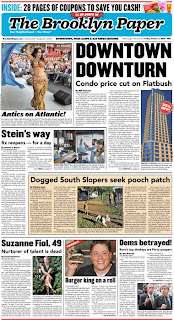 The lead story in this week's Brooklyn Paper comes with a banner headline: DOWNTOWN DOWNTURN: Condo price cut on Flatbush. Downtown super-broker Chris Havens told The Brooklyn Paper the price cuts aren’t a case of desperation on the part of the developer, but a dose of common sense. The Brooklyn Paper, in its editorial, states We’re still bullish on Downtown!. But there's nothing in the Brooklyn Paper, nor its Community Newspaper Group (aka Murdoch-owned) sibling Courier-Life, about the dubious KPMG report released Wednesday concerning the market for condos and rentals in the Atlantic Yards project. That report claimed that the Oro was 75% sold. Nor did the two newspapers cover the Empire State Development Corporation's September 17 vote to approve the 2009 Modified General Project Plan. In March, Brooklyn Paper editor-in-chief Gersh Kuntzman, who regularly reminds us how both he and the paper are "award-winning," asserted that "our coverage of Atlantic Yards has not 'tailed off.'" The evidence, however, shows that it has. The decrease in coverage of important twists and turns in the Atlantic Yards story in the Brooklyn Paper is palpable since Murdoch bought it. It is glaringly obvious, a disservice to readers and a shame, but sadly not surprising. One wonders what Ed Weintraub things about this sad state of affairs.